In the middle of the 20th century, the United States became a leading global supplier of rare earth elements (REEs). These valuable materials were used extensively in the manufacture of innovative technologies like colour televisions and other high-tech devices of the time. However, US dominance in the rare earth market began to slip near the turn of the 21st century, and now China exports almost all the world’s rare earth elements. Modern technologies, like those used in energy and defense systems, still rely heavily on rare earths for their manufacture, so the US Department of Energy (DOE) is working diligently to secure a domestic supply. To meet this goal, researchers at DOE’s National Energy Technology Laboratory (NETL) are researching better ways to characterise a variety of REE sources. Among the many ways in which NETL is approaching this challenge, is a new miniaturised laser technology that shows promise for quantifying the concentrations of rare earths in sources, such as coal and coal-related by-products. 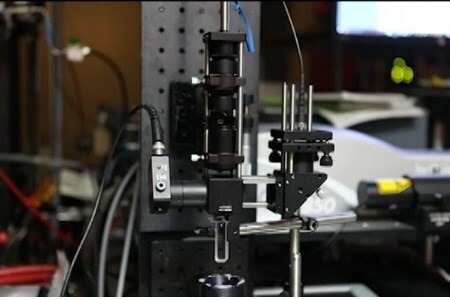 The sensor technology is based on laser-induced breakdown spectroscopy (LIBS), but NETL has miniaturised a traditional LIBS system so that it can be placed in situ and determine rare earth concentrations without the need to remove a sample and bring it back to the lab. Source characterisation is a crucial step for assessing the commercial viability of a potential extraction site. The system has successfully demonstrated rapid measurement of REEs in both solid and liquid samples at ppm level concentrations. The LIBS sensor is showing great potential for enabling successful REE extraction operations using sources like coal ash and acid mine drainage, which may help to invigorate coal country and attract advanced manufacturing facilities and jobs to those areas. Innovating powerful monitoring systems that yield quick and effective information in the field, is one way NETL researchers are building upon the Laboratory’s mission to discover and mature technology solutions that enhance the nation’s energy foundation and protect the environment for future generations.